Recently, Noah has become really into the alphabet. Let me just start by saying that before Noah went to school, we never really sat down to "work on the alphabet". We had alphabet things (books, magnets, puzzles, toys, etc) around the house to expose him to it, but I never drilled him with the song or worked on letter recognition in a formal way. I figured that as with everything, he would eventually get it. Now I don't know how much they work on the alphabet in a structured way at school, but all of a sudden it's just clicked! He can now sing the alphabet song on his own and can recognize most of the letters (the capital ones) by sight. He knows the letters in his name (thankfully he has a short name) and even knows how to write an O and an H all by himself. My whole point is that while these are some alphabet themed things that we like to play with at home (and seem to be helping), I by no means sit down and quiz him about his alphabet. As with everything, I find Noah (and most kids) learn best by playing. We have a few alphabet puzzles. I like each of them for different reasons. The first one we got was this Melissa and Doug Peg Puzzle. I liked it because underneath each letter there is a picture of an object starting with that letter. At the beginning, when Noah didn't really know his letters at all, he could figure it out by me saying "H is for house" and him finding the house. I also made this cool sensory bin/activity using the puzzle and a box of popcorn kernels. 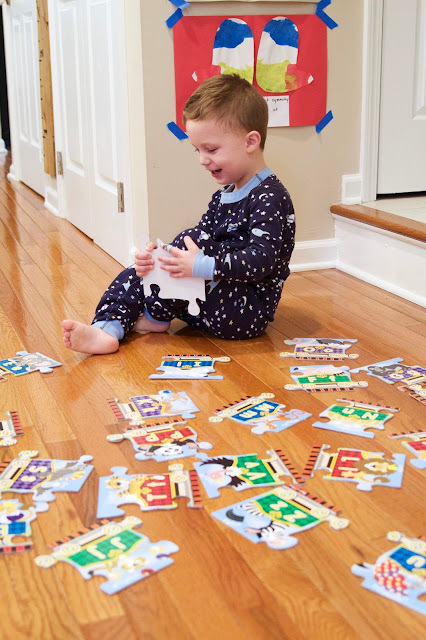 Noah loved finding the alphabet pieces and I really think it helped him learn a few more letters! I then decided to get Noah this Hape Alphabet puzzle for Christmas. I love Hape products and like that the wooden pieces are the actual cut out each letter. I find that this puzzle is really helping Noah learn what each letter looks like rather than simply associating it with an object. The next puzzle I want to get is the lower case version so we can work on those too! Not only does he like doing the puzzle, but we also started playing a fun game with the wooden pieces. Noah will pick a letter and ask me what in the room starts with that letter. So while I often have to identify the objects, he does come to me and says "what starts with S?". And after playing a few times, he is starting to learn what a few things start with on his own. I just like that he's even making the connection that letters make words. The final alphabet puzzle we have is this Melissa and Doug Alphabet Train Puzzle. A few of our friends had it and I just loved it. Noah is obsessed with trains so he really enjoys putting this puzzle together. For the letters he knows by sight, he tells me the animal that starts with it. But when he struggles with which letter/piece is next, I can still help him out by calling out the animal and having him find it that way instead. 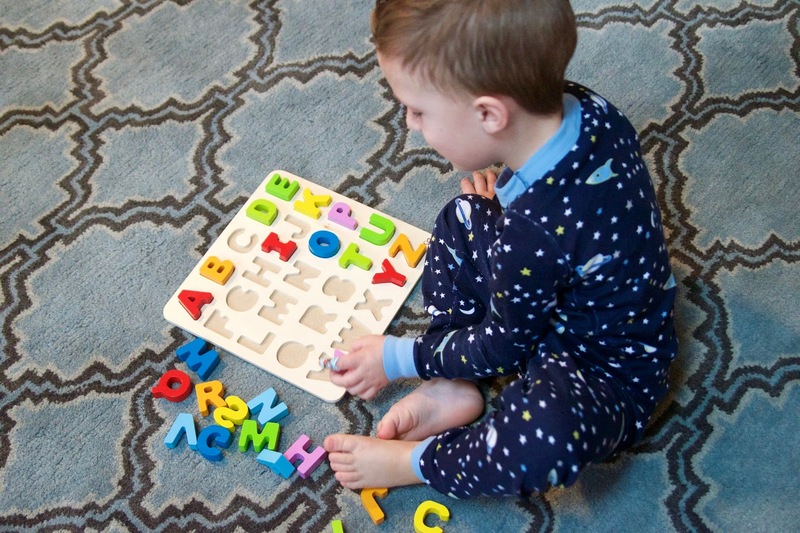 Another product we love are these plush alphabet magnets. Noah got them for his first birthday and at that age he just loved taking them off our dishwasher. Now that he's older, he likes to keep them in order and sometimes uses it as reference when doing his alphabet train puzzle. If he doesn't know what letter comes next, he will go over to the fridge, start singing the song and following along with his finger. When he gets to the next letter, he knows what it's called (because of the song) and now knows what it looks like. I love that he figured out this all on his own too! We also really love alphabet blocks. Not only does Noah love building with them, but he's recently started putting them in order and even finding the matching letters. It just amazes me how interested he is in the alphabet and the song. The ABC song is also his favorite song to sing while "playing his ukulele". And as with most things we are practicing at home, there are always a few favorite books that help reinforce the concept. Noah didn't used to be a fan of Chicka Chicka Boom Boom, but since he's gotten better at the alphabet, he finds it much more entertaining. It also made me realize that we still have all the lowercase letters to learn (hence why I want the lowercase Hape puzzle). When reading the book, he was confused as to what they were and why they didn't look like the letters he's been learning. We also love this Alphabet book by Matthew Van Fleet. The pages are thick, have moving parts, and the illustrations are really beautiful. It also comes with a full size ABC poster! We are in the very early stages of Noah learning to write his letters. Like I said above, he can write an O and an H, but that's about it on his own. A while ago we found this Letter School app that we downloaded for Noah's iPad. It's really pretty amazing how it introduces the capital letters, shows them how to write it (by following the lines on the screen), and then eventually has them try to write the letter on their own (without the guiding lines). There's a free version with limited letters or you can buy the full version and get the whole alphabet (we have the full version). Noah really enjoys the app and often chooses to work on his letters without any push from us. While I haven't done it yet, my friend Whitney (over at Work it Mommy), recently introduced me to this letter practice technique using highlighters. Simply write out the letters using a highlighter and then have the child practice their letters by tracing over it with a pencil. Simple yet genius!!! So that's how we help Noah with his ABCs. I'd love to hear suggestions on how you helped your kids learn and write the alphabet! I am linking up with a bunch of my blogging friends (Work it Mommy//Tickled Pink//Sweet Turtle Soup//Our Pretty Little Girls) for their Teaching Together Blog Hop. Isn't it amazing how all of the sudden they just get it? Cam is the same way. His teachers work so hard on learning to spell their name and learn all the letters. I love hearing him tell me about it when I pick him up. And we do things at home too. Have you ever heard of the game Kaboom? You can do it with anything actually, but we do the alphabet. You put one letter on a popsicle stick, so you'll have 26 sticks. I put the captial on one side and lower case on the other. Then you take a few more sticks and put a dot on each of those. Put them in a cup and take turns pulling out the sticks. Noah would say what letter it is. If he gets it right he gets to keep the stick. If he pulls out a dot, say kaboom and all his sticks go back in the cup. Cam loves this game!! Those alphabet magnets are SO cute!!! Such cute ideas! I love your plush ABC's and we are long time Chicka-Chicka Boom-Boom fans. It is so great when things start clicking! 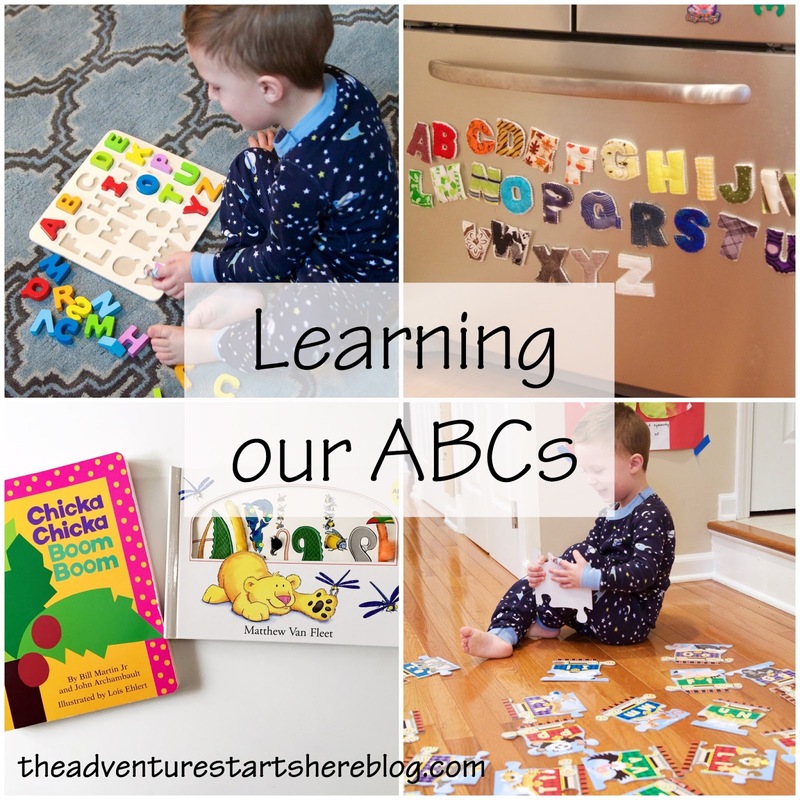 I just recently got some alphabet apps for Kinsey that are fun, a Winnie the Pooh one ($3) and a free one ABC Alphabet and now of course I want to get yours! I tried the link for the magnetic letters and it didn't work, wahhh. 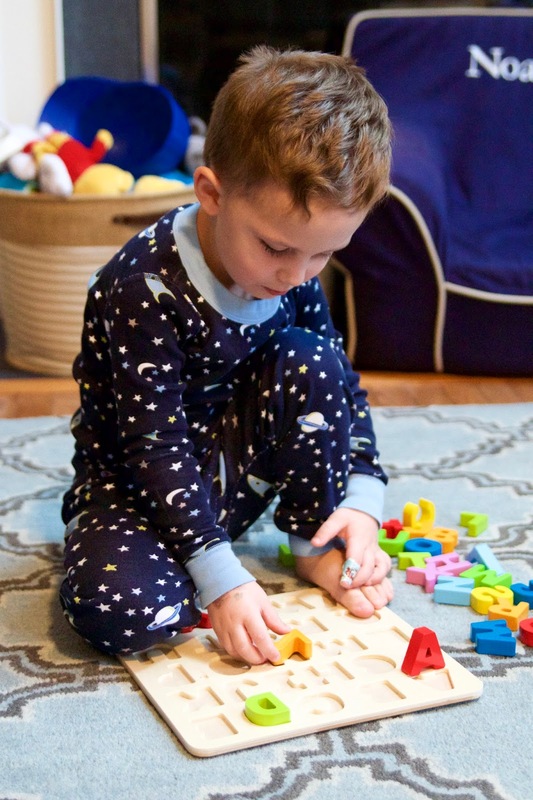 Have you seen those play dough mats that have the kids trace the letters using the dough? I want to try that next! Chicka Chicka Boom Boom is the greatest book ever. We still read it frequently! We have that same Hape alphabet puzzle and Mason LOVES it! I'm constantly amazed by all the letters he knows and can recognize and match. 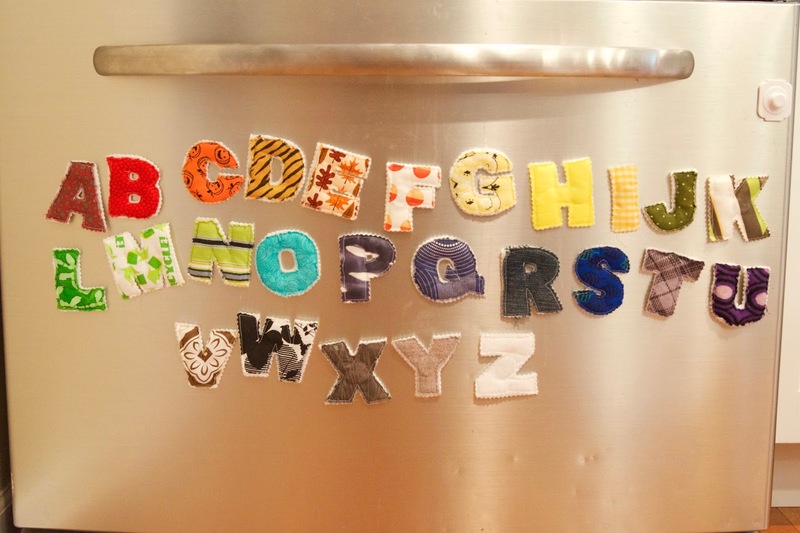 We also have alphabet magnets on our fridge (I think Melissa and Doug) and he loves to match the upper case and lower case. It's so exciting to hear them sing the alphabet song on their own!